Cake for the holidays is a must, specially in Dominican households like the one I grew up in. I’m excited to share my Mom’s Dominican Cake recipe, along with some photos from our visit to Carlos Bake Shop in Vegas – be sure to scroll all the way down for a baking giveaway! If there’s one dessert that’s a family favorite, it’d have to be a Dominican cake. And if you’ve never had said Dominican cake, you might be wondering what makes this cake different, what makes it delicious, why is it a favorite of ours? Well my friends, let me tell you: it’s my mother’s recipe, it’s a deliciously flavorful cake, and it’s covered in sweet Italian meringue! 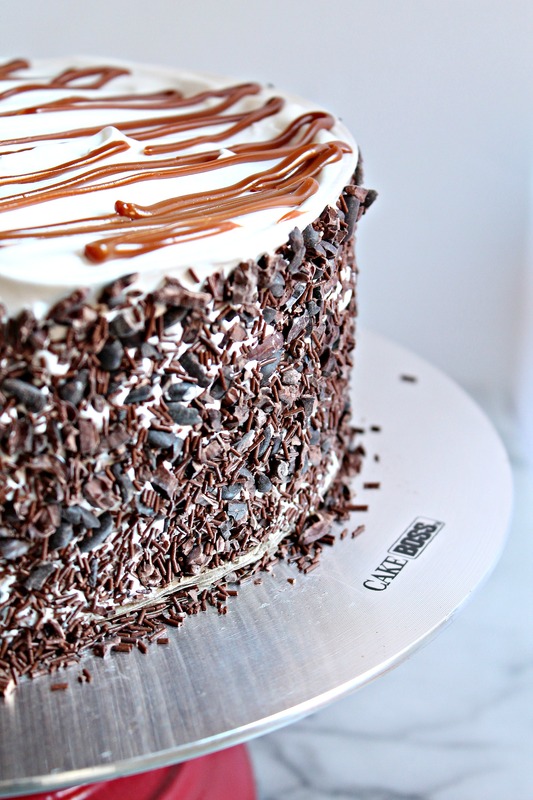 If you’re a dessert lover like I am, you’ll surely love this cake. Last month, my husband and I spent two weeks on the West coast traveling through Napa Valley, San Francisco, and ending with Las Vegas. 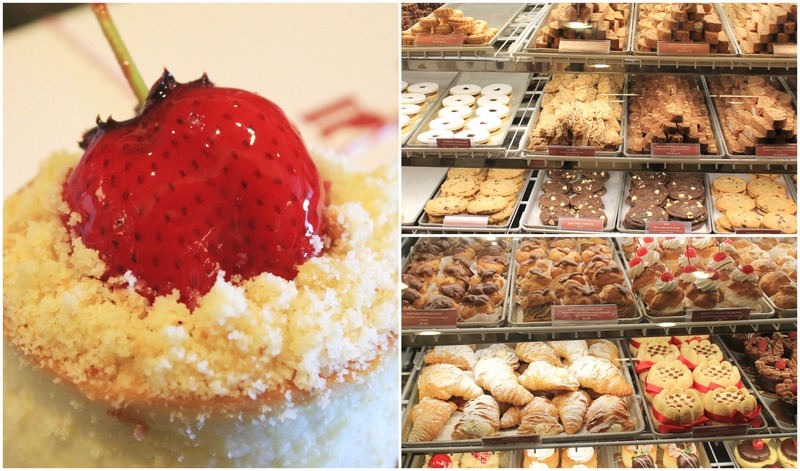 Vegas is one of our favorite places to visit, not only because the weather is always fantastic, but it’s packed with some of the best restaurants and bakeries, one of them being Carlo’s Bakery of Cake Boss. Even better is the fact that I had a chance to tour the bakeshop and taste some treats. The bakery at the Venetian Las Vegas has been open for only 8 months now and has created a local and visitor following! Selling over 100 cheesecakes a day and their lobster tails and cannoli being the most popular baked goods, I can attest to that popularity. The cheesecakes are so light and perfectly sweet and their cannoli would make any Italian grandmother proud! 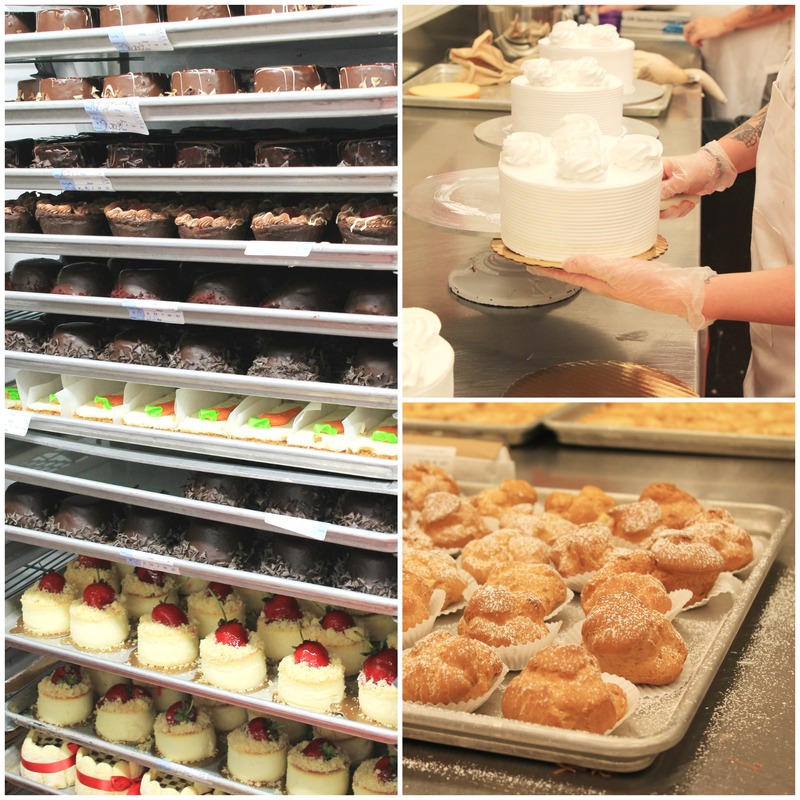 If you have the opportunity to visit Carlo’s Bake Shop at the Venetian in Las Vegas, definitely stroll by for a visit! 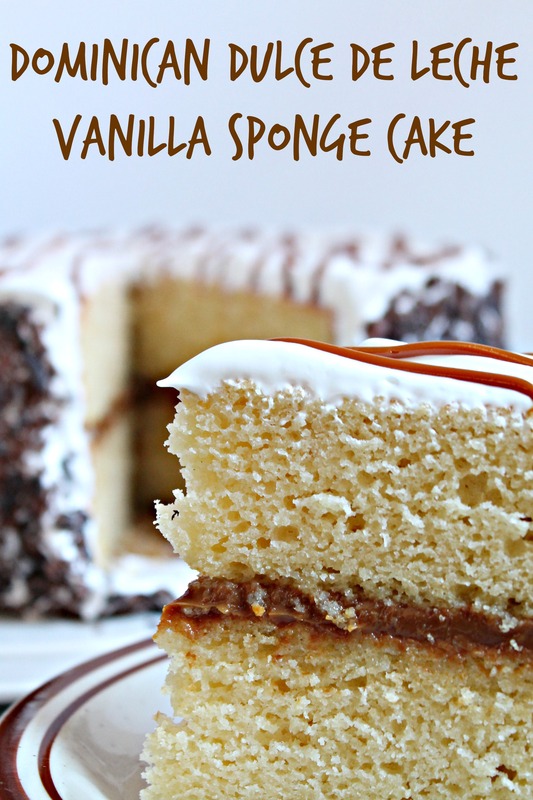 In the meantime, I’m sharing my Mother’s recipe for her Dominican Dulce de Leche Vanilla Sponge Cake – a gorgeous cake to make for the holidays. A huge thanks to my Mom for sharing this recipe with me – it’s been the recipe she’s used for every birthday cake I ever had, so I assure you, it’s tried and true. To help you during this holiday baking season, we’re giving away a cake carrier and turntable (be sure to scroll to the bottom for the Rafflecopter giveaway!) The cake carrier makes it easy to transport cakes this holiday season and the turntable is must have tool if you want gorgeous decorated cakes all year long! This is my mother's recipe for the best Dominican cake ever - filled with dulce de leche and covered in sweet Italian meringue, you'll fall in love with this cake! Preheat your oven to 350F and grease two, 9 inch round pans. Set aside. Using a stand mixer or hand mixer, cream the butter, sugar and vanilla until light and fluffy (about 5-10 minutes). Incorporate the eggs one at a time. In a medium bowl, whisk together the flour and baking powder and in a smaller bowl whisk together the milk, orange juice, and white vinegar. Add the dry ingredients and the wet ingredients, alternating each until everything is mixed in. Do not over mix! Pour batter into greased pans and bake for 45 minutes, until golden brown. Let cakes cool all the way through before filling and decorating. To fill: spread the dulce de leche on top of cake and place the second cake on top (if cakes are domed, level with knife before filling). To make the Italian meringue icing:Place the egg whites in the mixer bowl and add 3 tablespoons of sugar. Start mixer on slow while you make the sugar syrup. In a small sauce pot over medium high heat, boil the 1½ cups sugar and the water, until syrup reaches about 240F degrees. Turn your mixer to medium speed and slowly drizzle in the syrup. Once all the syrup is added, turn the mixer to high and whisk for 5-10 minutes. Place cake on turntable and cover with icing on the sides and top. Smooth and coat the sides with sprinkles or cacao nibs. Drizzle with dulce de leche on top and serve. Keeps for 4 days unrefrigerated. Disclaimer: Thanks to the brands for sponsoring this giveaway and to Carlo’s Bake Shop in Las Vegas for letting us tour their bakery and taste their treats! Oh and to my Mom for sharing her cake recipe! I made the cake in two days (I have a bad back and it wouldn’t hold out the first day) so I don’t know what impact it will have on the cake’s texture. I just had to send my husband out to buy dolce de leche because I thought that was something I had to make. I’ll let you know how it comes out and will take a picture if it looks nice. This cake is for a friend whose mother is visiting from the Dominican. I’ll surprise them tonight. My favorite holiday dessert is cranberry cheesecake. My favorite holiday dessert is lemon cake with lemon icing. Oh my, what a day! My mom used to make pudin de pan and it was my favorite. I wish I could taste hers right now!!! I am going to give your mom’s recipe a try! I’m puertorican and we call it Budín de pan, not Pudin. The difference between them is that Budín is made with bread and the Pudin is more like a custard. I love budín and it is really easy to make. Your Momma would be so happy and proud of you if you make her recipe ;o)~ Bendiciones! My favorite holiday dessert is a cranberry-walnut pie I’ve been making for the last few years. It’s delicious, and perfect for this time of year. Goodness your cake looks delish! My fave Christmas recipe is our over 100 year old recipe from my grans family in Georgia..Southern Traditional Red Velvet Cake..not like the ones you tend to see. Also various Christmas cookies. Thanks so much. Oh, forgot to add..I adore this vintage cake plate..my whole kitchen is vintage red, white, and turqoise..so this would fit right in and my red velvet cake would look beautiful in it…vintage cake in vintage tin. My favorite are the sweet empanadas my sister’s mother-in-law makes. I love the pineapple ones. My favorite is Itaian Cream Cake with lots of pecans and coconut. My favorite holiday dessert is chocolate mousse cake, thank goodness they only come once a year! I have always wanted to try to make a Dominican Cake, I will be making one for Christmas this year, maybe even two! I think my favorite holiday dessert is a tie between pumpkin pie and pecan pie, but I also love apple & pear crisps around this time of year. My favorite holiday dessert is Eggnog Bundt Cake (with bourbon glaze!) YUMMY!! My favorite holiday dessert is sherry wine cake. My favorite holiday dessert That would be like choosing my favorite beagle (I’d say child, but I just have one of those and two beagles). I can’t choose! Give them all to me (starting with a piece of this cake, please!). I love pie. Sounds simple but oh so good!! Your cake is beautiful! My favorite holiday desert is my spiced cranberry topped New York style cheesecake. I love all the homemade Christmas cookies especially my Mom’s Swedish Almond cookies. My favorite holiday dessert is creamed sherry bundt cake BUT I want this cake!!! My favorite holiday dessert is Red Velvet Cheesecake. I love frosted sugar cookies the best. Gorgeous! I hope this will be one of your most read posts, stunning!!! Pastries are my favorite holiday dessert. I especially like cream puffs, eclairs and lobster tails. This cake looks amazing, I love the close up shot showing the texture. Many times I see cakes that look great on blogs but the inside is what really sells it for me. Texture, crumb and moistness are very important. I like cut out cookies mostly because the fun I have making them with my kids. I wish I’d known about Dominican cake before because ohmword, this sounds and looks delicious. My favorite holiday dessert is the yummy combo of cherry and chocolate baked with love in a cake topped with fudge frosting and chocolate covered cherries.